The Reliance was built as a 251 gross ton wooden hulled steam lighter in Bath, Maine in 1903. 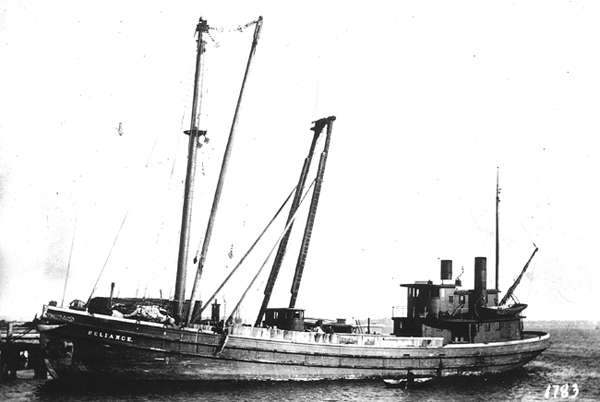 The vessel was owned by the Boston Sand and Gravel Company of Boston, MA. From 1903 to 1921 the Reliance functioned as a steam lighter housing a 400 HP engine. The vessel had a large mast and derrick situated forward and a pilothouse with living quarters aft, as is seen in the photo. The engine was removed sometime in late 1921 and from 1922-1933 the Reliance functioned as an unrigged vessel or barge until it was scuttled on August 3, 1933. This wreck was initially referred to as “SB-120” when it was first discovered and surveyed by divers aboard Gauntlet. Today the wreck exists as a low lying structure in about 120 feet of water on a sand bottom. The stern section has some remaining intact portions of the hull, as well as the shaft log and rudder. The general shape of the hull is intact along the perimeter but otherwise not much structure remains. The wreck is mostly comprised of beams and framing mixed in with coal. In the bow area, two large hawse pipes remain. The bow is otherwise splayed open. There is some debris near the wreck out in the sand, which may or may not be related to the wreck. The anchor chain and windlass have been removed and the shaft log has been plugged with wood, which is consistent with conversion to an unrigged barge and removal of the power plant. All in all this is a very nice dive. The visibility is generally good with about 20 feet on average. Surface current (tidal) can become strong and the wreck is near a shipping lane, so caution is warranted. There are plenty of cod and other marine life on the wreck.